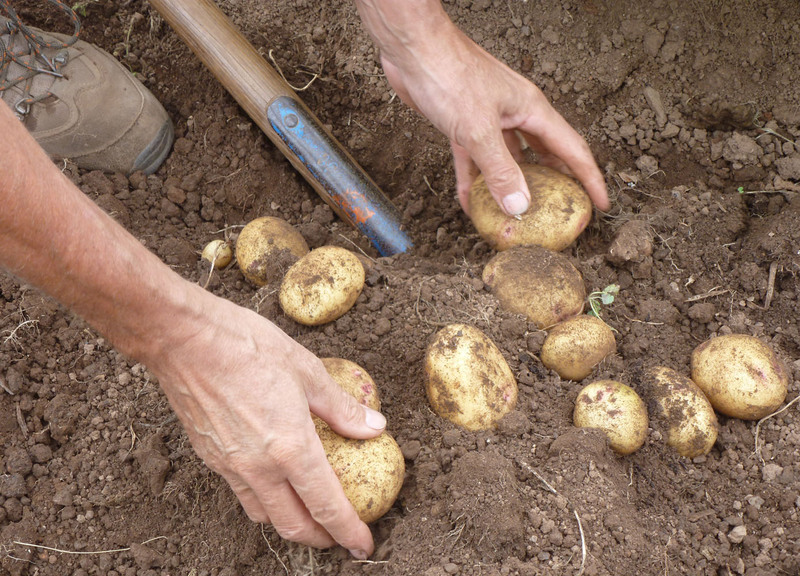 There’s nothing like digging up a good crop of potatoes. How does planting just one seed potato create a dozen or more of the plump little rascals? They make such a satisfying thump as they go into the bucket. Digging potatoes - you never know how many you are going to get, or what size. It adds to the magic. In the kitchen, home-grown potatoes are so well behaved. They fluff up to make beautiful, smooth mash. Their soft edges rough up evenly to make super crisp, golden roasties. I even pushed some through my ‘spiralizer’ and made potato noodles to add to a duck soup. They held together astonishingly well. Even the best supermarket potatoes just don’t perform as well. Being grown and stored in slightly different conditions means that the individual potatoes don’t respond evenly to cooking. Hence it’s no surprise to get lumpy mash and roast potatoes where some are burned before others are barely cooked. This is before we even start to consider the taste. Truth is, home-grown potatoes actually have a taste, whereas bought ones tend not to. Picasso – best for baking. They have beautiful skin that crisps up like flaky pastry and creamy flesh that pulls the butter right into its heart. 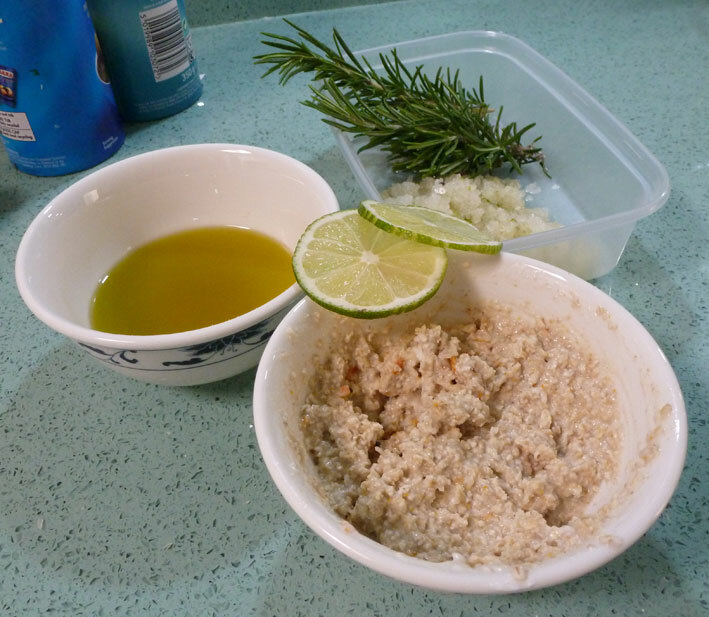 Red Cara – very floury, and great for mash. It’s a great ‘gluey’ potato and sticks together for dishes like potato pancakes, or my ‘Burger in a potato crust’ recipe. Heavy cropping. Valor – reliable and even sized. Excellent for all culinary uses. Trouble is, what to do with them? Potatoes seem to scream out for lashings of cream, cheese and butter. Not in our house, unfortunately, because hubby is lactose intolerant. I’ve had to be inventive to come up with some ways to add interest to the bounteous crop. I’ve found some! 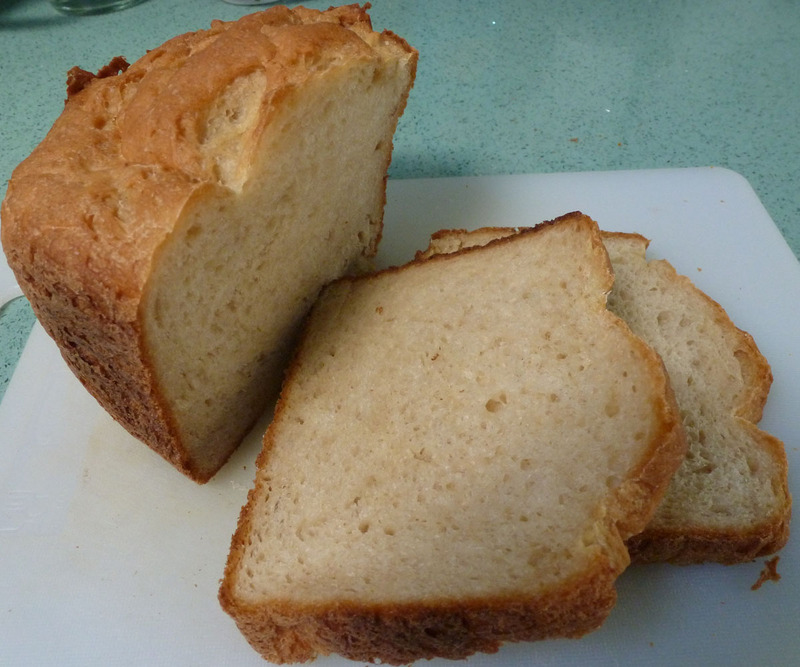 Potato Bread. This was an agreeable surprise. I thought the result would be really heavy, but it’s not too bad. It’s quite chewy and supposed to store for up to a week, but we haven’t managed to make one last for more than a couple of days. Must be tasty, then. It’s easy, involving substituting approximately one third of the flour with plain mashed potatoes. It titillates my tightwad tendencies by allowing me to get four loaves out of my 70p bag of Morrison’s bread flour instead of just three. Wow – a loaf for less than 30p. Can’t be bad. Chewy and tasty - somewhere between ciabatta and an English crumpet. Indian food has a wealth of ways for using potatoes with splendid results. Potato parathas. These are fascinating and incredibly easy. A blob of spicy mashed potato is placed on a disc of thin flour dough, gathered up into a dumpling shape, then carefully rolled out into a pancake. It should be fried, but I paint them with a little oil (to make them less fattening! Yeah – right!) and cook them in the oven until they are puffed and golden. I make samosas and saag aloo, too. I make my own thin pastry for the samosas, which hubby always complains about and says I should use bought filo. My home-made ‘filo’ is about a quarter of the price, so he’ll have to put up with it being twice as thick. This is my ambition, and here are the four ‘rules’ I’ve evolved to achieve it. Well, I don’t mean don’t EVER eat out. It’s a lovely thing to do with friends, for special occasions, and to treat yourself to some really good quality, exciting scoff. I mean don’t do accidental eating out. This is usually harbingered by flopping in a chair, feeling tired and uttering the words ‘I can’t be bothered to cook’. This is the moment when you order a really mediocre takeaway, or end up in a nearby pub that may not serve the greatest food. It costs a fortune and can be completely unmemorable, unsatisfying and dull. I calculate that this rule alone has saved me about £12,000 pounds these last six years. I enjoy cooking everything from scratch, and it really is the cheapest, healthiest way. Sorry! Double up the quantities so that you can freeze some for eating down the line, when you have an ‘I can’t be bothered to cook’ moment. For real economy, use dishes from countries that have traditionally been quite poor. They’ve really got the hang of squeezing great tastes out of the cheapest ingredients. My favourites are India, southern Italy (la cucina povera) and Mexico. You need a good set of spices. When I was working in London I used to go to the Hoo Hing on the North Circular Road. That’s one of the few things I miss about working life. I see they have an online store, so I shall be frequenting that very shortly. I buy whole spices and used to have a pestle and mortar, but now use my super Krups coffee grinder. That’s another whole opportunity for exercise gone. The dried orange peel on the right is surprisingly useful. 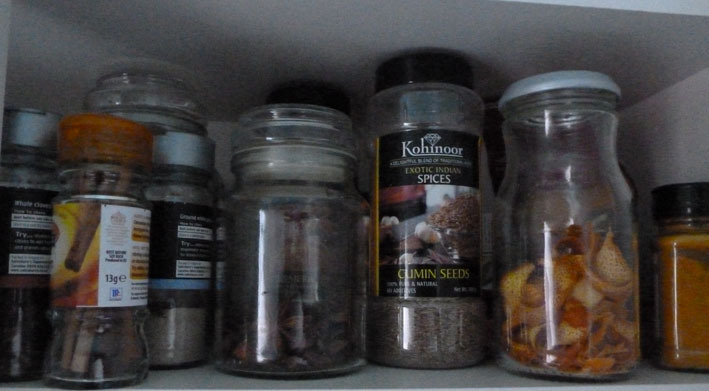 I’ve got some odd things in my spice cupboard – dried orange and lime peel, for two. I use a vegetable peeler to cut strips of zest from my oranges in the winter before I eat them, sitting in front of the telly. I put them in a little basket on the radiator, and they make the room smell nice. They are great popped in an infusion of green tea, and really tasty when added to spice blends before grinding. Orange combines with star anise in Chinese dishes, and lime peel works well in some curries and Chilli con carne. 3. Don’t buy entertainment media. That means DVDs, CDs, magazines and books. We wait for movies to come up free on our communication package (BT Vision in our case – very good). Magazines (apart from the Saga one, of course) can be such a disappointment. I don’t understand where a magazine that looks fascinating in a friend’s house is suddenly very skimpy and dull when I buy an issue myself. I use the internet now for all my magazine-type needs. Read library books. Our library in Brixham is a lovely place. The only problem is to remember to return the books on time. Nothing brings out a tightwad apoplexy in me like having to pay a pointless fine. That issue has led me to thinking that an electronic reader would be good. Apparently the downloaded library books just conk out at the right time, so you don’t have to physically return anything. Unfortunately the readers cost £200+, so I’m still mulling that one over as a viable tightwad possibility. When I worked in a laundry as a student summer job, back in the 70’s, I used to love getting my manila pay packet, replete with pound notes (what a memory!) on a Friday. First stop would be the newsagent’s where I would kit myself with magazines, sweets and ice-cream for an afternoon lounging in the garden (it was hot in the mid 70’s). Those days are gone now, and we just shouldn’t be having any of that. 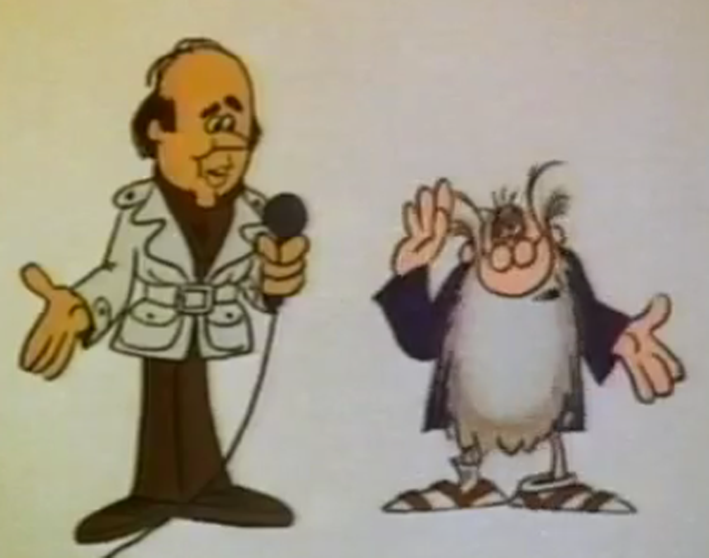 Mel Brooks created a character called ‘The two thousand year-old man’. I love what he says at the end of the movie. When asked what his secret is, he replies ‘Keep smiling… and stay out of those little, low Italian cars’. I would add to that ‘…and newsagents’. To tell the truth, I’ve been feeling a bit clapped out. A month of ‘flu and lung infection has taken its toll, and the daughter’s wedding is now only two weeks away. A friend of mine told me about the magical effects of a week in a spa, over the bay in Torquay. She went there every time she felt flaky, and swore by it. I pored over the website, and it did look very attractive. Apart from the price, of course. £200 for a couple of days! Firstly, I’ve got the same seaside venue, just there, outside the door. Free! I can do that. I’ve got sea salt, lime and ginger in my pantry. Then I considered what I would need a spa to do for me. Fresh air, exercise, great ‘cleansing’ grub and a few fancy treatments. I can do all of those. ‘Energising’ breakfast of grapes, banana and bio yoghourt. Walk by the sea (to the allotment). Commune with tomato plants. Return via Breakwater Beach. Wriggle toes in sand and waves, and try to persuade passing mackerel shoal to administer ‘fish pedicure’. ‘Cleansing’ carrot and herb soup for lunch. Retreat to spa (bathroom) and apply rosemary and olive oil hair treatment, honey and oatmeal face masque, and ‘Exotic Lime & Ginger Salt Glow’ my body. Meditate in spa bath while all treatments do their magic. Spicy beanburgers and salad for supper, washed down with loads of green tea. I took my inspiration from a couple of web sites – ‘Spa index’ and ‘Lifescript’ – and assembled the ingredients. 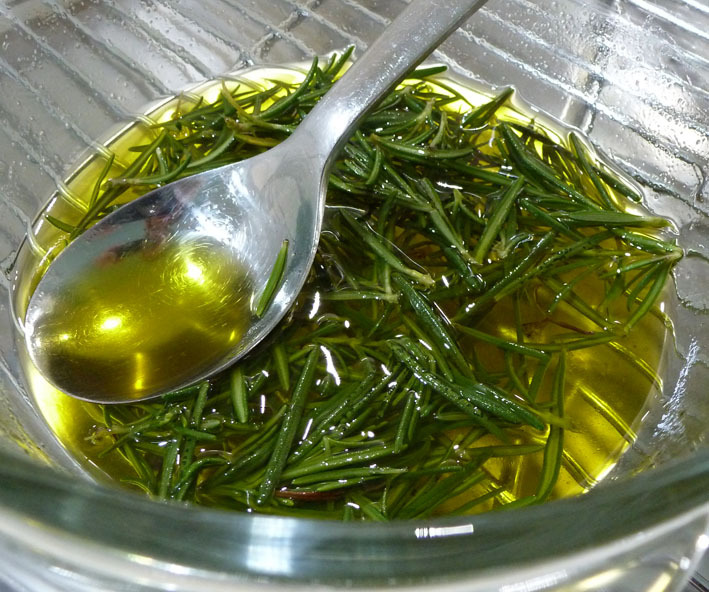 I hadn’t got ‘essential oil of rosemary’ for the hair treatment, so I hacked some clumps of rosemary from the back yard and steeped them in microwave-warmed olive oil and honey. It seemed to work OK. I whizzed up some oatmeal with some dried orange peel, added honey and yoghourt. It was delicious. I stopped myself eating it. I wanted something for my eyes, but there was no way I was buying cucumbers, due to their current notoriety. ‘Deadly cucumbers claim more lives’. I decided on slices of lime. I’m not letting deadly cucumbers anywhere near my eyes. Left: Rosemary infused oil and honey, for hair. 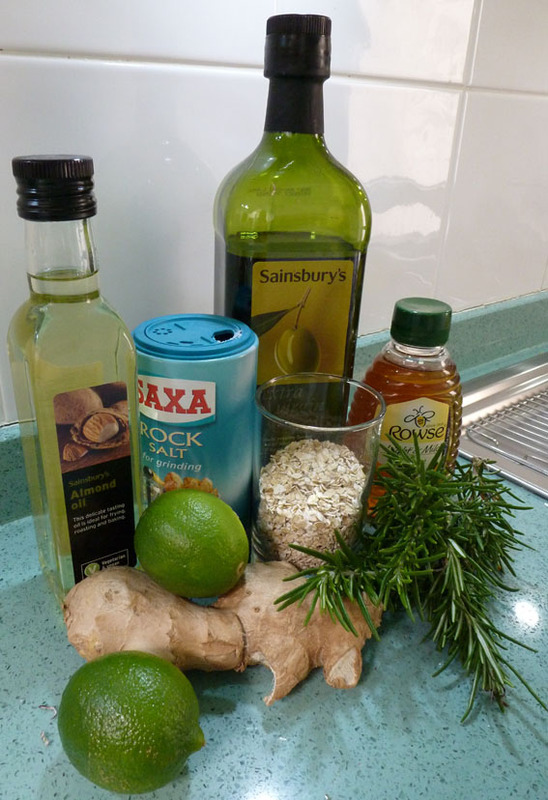 Top: lime and ginger body glow (rosemary sprig added for glamour, to disguise used takeaway carton receptacle). Front: yummy oat face masque. Looking back, the day went fairly well. The walk was good. Unfortunately, due to it being a Bank holiday weekend, when I got to my ‘fish pedicure’ venue there were just too many people around. Brixham’s Breakwater Beach is made up of the most gorgeous, flat, skimmable stones. The end result is that visitors spend most of their time throwing the beach into the sea. Nature seems to be on our side, because the winter storms usually deposit all the stones back on the beach, ready for the next spring. If I’d tried to sit in a contemplative position at the water’s edge I would have been pulverised by thrown stones. The bath wasn’t the relaxing, meditational experience I’d hoped. 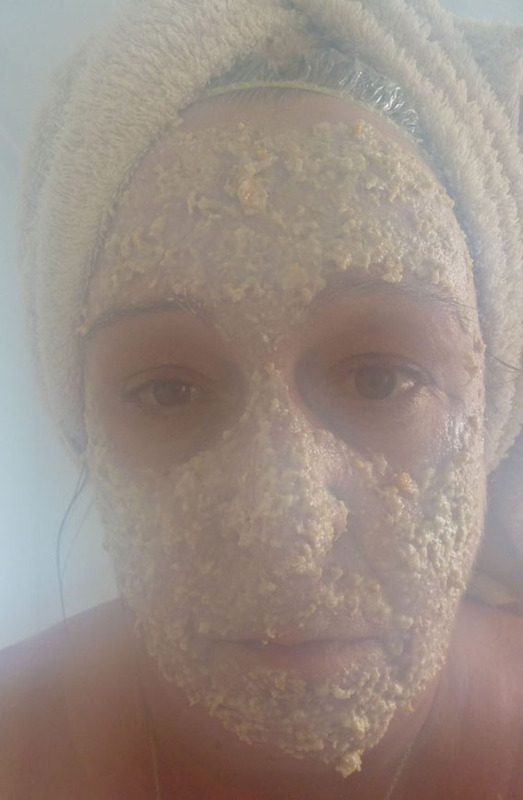 The oaty face masque was constantly marching down my face and dripping into the bath. The lime slices on my eyes – well, eyes don’t like acid lime juice running into them.. My stomach didn’t find the bath’s massage jets as relaxing as usual, due to trying to simultaneously deal with digesting several pints of carrot soup. I only managed about ten minutes before I stumbled out of the bath, eyes streaming and shedding little oaty, salty bits all over the room. I’d rate it a partial success. Right now, I feel myself glowing. My hair feels smooth, heavy, kind of different, like someone else’s hair, but not unpleasant. My skin’s smooth and kind of gooey, due to the almond oil in my ‘salt scrub’. Ultimately, I conclude that the whole spa ‘thing’ actually needs you to spend a lot of money. That’s part of it. I probably haven’t even saved that much when I have to pay DynoRod £200 to clear my drains of all that oatmeal and oil.